The fatal stabbing of a Yemenite Jewish leader on Tuesday has raised fears for Jews no longer protected by a benevolent government. The fatal stabbing of a Yemenite Jewish leader on Tuesday has raised fears for a community that has been living under the spectre of the Arab Spring uprisings for more than a year, and may no longer be living under the protection of a government that protected the community's interests. More details have become available about the murder of a Yemenite Jew who was killed in the Yemenite capital of Sana'a on Tuesday. Aharon (Harun) Yusuf Zindani was stabbed to death in the Sa'awan market near the U.S. Embassy in the northeastern section of the city. "We are trying to get more information about what happened,” Foreign Ministry spokesman Yigal Palmor told Arutz Sheva on Wednesday. “But it's hard to track down details in Yemen. It's not a very orderly place at this point.” Zindani made aliyah to Israel during the 1990s. 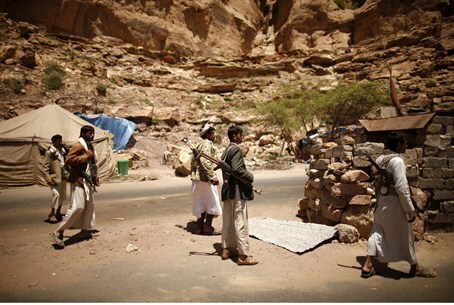 But he later returned to Yemen, citing difficulties in adjustment to his new environment. The man added that the few dozen Jews living in the city still apparently “do not feel they are in danger” despite the multiple murders in recent years, and despite the discrimination by security officials and the judiciary. The internecine violence and struggle for control of the government is not nearly ended, despite the successful toppling of former President Ali Abdullah Saleh's 33-year regime. On Saturday, thousands of journalists and anti-government protesters massed in the capital to demonstrate against the jailing of a journalist with suspected links to the Al Qaeda international terrorist organization. Some 90 soldiers were killed and 200 others were wounded Monday in a suicide bombing attack at a military parade rehearsal near the presidential palace. It was one of the deadliest attacks in the city in years. It is believed that an estimated 200 Jews still remain in the country. After Jewish community leader Moshe Yaish Nahari was executed by Islamists in the market in Amran by Islamists for his Jewish faith in 2008, Yemenite authorities were concerned about the impact of the murder on the country's image internationally – and its subsequent ability to obtain foreign aid. It was Saleh who ordered the Jews evacuated from the city, in response to the international condemnation sparked by the murder. The president also arranged for the 50 families to each receive a plot of land in an area east of the capital, San'a. He also allocated to each a grant of $10,000 with which to rebuild their households. However, with the Arab Spring uprisings and Saleh's ouster, official protection of the Jews can no longer be counted upon.